The Hook Bill has a fascinating history of domestication and is linked to the canals of Holland where it was kept as an egg layer. But although domesticated, it was released in the mornings to fly off and find its own food and return in the evenings thus being very economical to keep. There are theories that the curved bill (the Hook Bill of the name) was encouraged so that hunters could tell the difference between the domesticated ducks and the wild ducks on the canals. Charles Darwin is believed to have kept these ducks and describes them in his books. It is thought to have originated in Asia and arrived in the Netherlands via the Dutch trading routes. 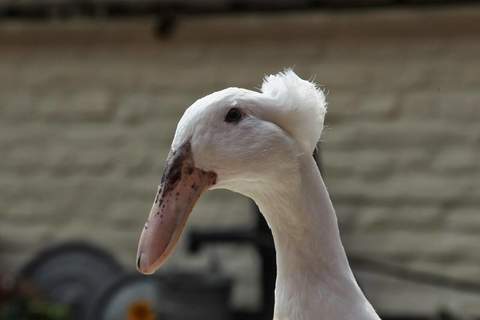 In the UK it has not been so popular but as with other duck breeds, was promoted in the 1980s by fanciers at that time. The Hook Bill is unique in appearance due to its bill but it is a useful duck as it is still an excellent forager and some strains are capable of laying over 100 eggs per year. It is a good table bird. Independent but docile, it will brood its own eggs and best kept as breeding pairs or trios. Beware, it is a good flyer so the wings will need the flight feathers clipping. It is classified as a light breed and comes is standardized in three colours although specialist breeders produce non standardized colours too. The three colours are white (with bright orange legs) , dark Mallard and white bibbed dark Mallard. Some people are put off by the bill shape but they are a beautiful bird overall and good doers. Our hookbills are very self sufficient and not terribly friendly but given time they will stop for a quick chat. Hookbills are very intelligent birds, if you watch them you will see them trying to work out various problems like, how to get into the lettuces. Be very careful what you show them as it will be imbedded in their memory forever. They produce lots of lovely duck eggs but I've found ours aren't very broody.